Kai Tak Sports Park, a subsidiary of New World Development and NWS Holdings, has won the contract for the design, construction and operation of the HK$30 billion ($3.84 billion) sports park in Hong Kong, said a report. 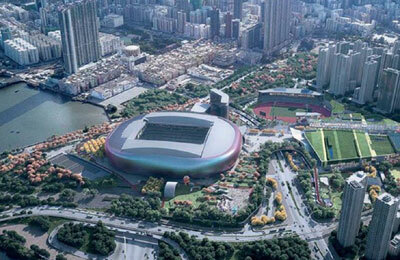 Kai Tak Sports Park was chosen by the government following an open tendering exercise, reported the Construction Index. The 28 hectare sports park will be the biggest sports venue in Hong Kong. The focal point will be a 50,000-seat main stadium, which will have a soundproof retractable roof and flexible pitch surface. It has been designed to host major football and rugby games as well as entertainment and community eventsm, stated the report. Also included in the scheme is a covered avenue that will serve as the main axis, connecting all key facilities of the sports park with the adjacent Station Square, Kai Tak MTR Station and Sung Wong Toi MTR Station, it added. The contract for the park is for 25 years, including four to five years for design and construction and about 20 years of operation. The government will fund the construction cost of HK$29.993 billion and the company is required to cover all operating costs and pay the government 3 per cent of the gross income plus HK$1.724bn during the operation period, stated the report. Construction is scheduled for completion in 2023, it added.